TTC's proposed second exit for Donlands subway is on hold for now. Image courtesy of TTC. City council voted Feb. 23 to defer building controversial second subway exits at Wellesley, Donlands, Greenwood and Woodbine TTC stations. A motion by Councillor Mary Fragedakis to amend the Toronto Transit Commission’s capital budget was approved during the city’s budget debate. Baby Point resident Dr. Robert Galway wants a heritage district in his community. Photo by Karolyn Coorsh/Town Crier. Robert Galway stands on the street on a chilly but sunny Sunday morning staring at what appears to be a makeshift hockey rink. Actually, it’s the former location of a stately home in the Baby Point neighbourhood, a house that up until recently stood next door to the one-time residence of Maple Leafs’ fabled owner Conn Smythe. Until Nov. 30 when bulldozers drove in, the makeshift “hockey rink” was an Arts and Crafts-style home, built in the 1920s. Months ago, when the owners of 66 Baby Point Rd. applied to the city for a demolition permit, it was granted. It should not have been, Galway contends. Once a hobby, protecting these Baby Point homes has now become a mission for Galway, a longtime resident of the area. Concerned his Toronto neighbourhood could be vulnerable to developers, Galway is attempting to make Baby Point a heritage conservation district. Mayor Ford talks to city hall media Feb. 23 about the budget. Town Crier file photo. The good news is that city approved its 2011 operating budget today with a tax freeze. However, the 2012 budget is already shaping up to be one that will involve hikes in TTC fares and property taxes and selling off city assets to fix the projected $774 million hole for next year’s budget. 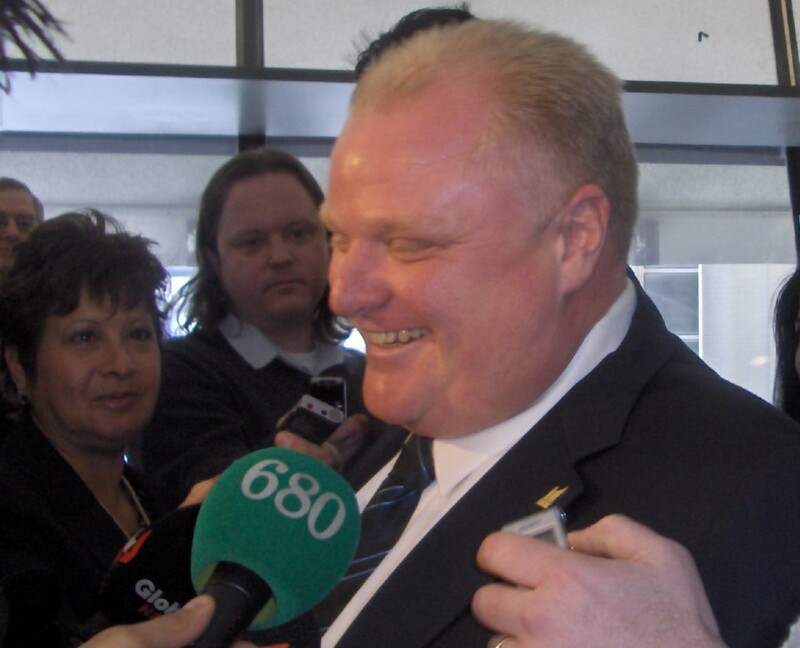 Mayor Rob Ford was beaming after the passage of the first operating budget of his administration. Ford said not only did he attend the four public meetings on the budget with hundreds of deputations, but personally returns calls from Torontonians regarding their priorities. “If you talk to the citizens out there, I am sure 99 percent of them are happy at not having to pay higher taxes,” he said. The city passed the $9.381 billion gross budget with few amendments. Councillor John Filion that did get one through with a 44-1 vote to increase the Toronto Public Health Budget with one-time provincial funding of $100,000. This money from the provincial Ministry of Health and Long Term Care is earmarked for a communication strategy to encourage HIV and Syphilis screening. Mayor Ford was the only one to vote against this provincial money. “Everyone says it’s provincial money. No it’s taxpayers’ money,” Ford explained his vote to the media. Agnes Macphail house heritage worthy? Agnes Macphail lives at 2 Donegall Ave and efforts are underway to push for a heritage designation and plaque of the property. Photo by Joshua Freeman/Town Crier. Walking by 2 Donegall Ave in Leaside you wouldn’t know it was once home to politician Agnes Macphail. The 1937-built home is neither historically listed, designated nor does it have a plaque recognizing it as the former abode of Canada’s first female MP. Residents and politicians have been pushing for over a decade for some recognition for the Toronto property and while things are currently at a standstill, there is renewing pressure to have something done. The Simmons family, owners of 2 Donegall Ave/720 Millwood Rd home, agreed to install a plaque in 2001 as a compromise to avoid the building becoming historically designated. But the plaque never materialized because there was no agreement on the wording and cost involved, said property owner Laura Simmons. She told the Town Crier Feb. 23 she would be agreeable to erecting a plaque if it cost her $500 maximum, but is still against designating her home. Mary Macdonald, acting director of Heritage Preservation Services, said city staff had recommended designation in 2001, but council voted for the plaque instead. So the Economist rated Toronto number 4 out of 140 on its list of most livable cities worldwide. The Economist used a ranking of 0-100 with 30 factors to determine the best cities to live based on 5 categories: health care, culture and environment, education, and infrastructure. Here are the top 10 cities on the list. The Economist rated Toronto 4th most livable city worldwide. Mayor Ford is pleased council supported a 2011 property tax freeze. Photo by Kris Scheuer/Town Crier. The weather may have warmed up, but inside city hall council voted to freeze taxes on the first day of a four days of budget votes. Mayor Rob Ford didn’t campaign on a tax freeze but he announced after the election a tax freeze was a priority. “Taxpayers won’t have to pay a property tax increase this year,” Ford told the media. After the vote Ford said that taxpayers sent a clear message during the election that they are sick and tried of wasteful spending at city hall. “We saved $66 million in the first 100 days that’s more than the previous government saved in seven years,” Ford boasted to the assembled media. The biggest saving came from canceling the vehicle registration tax as of Jan. 1, which gives taxpayers $64 million back, said Ford. However, canceling the tax means the city will lose $48 million in revenue and it will cost the city/taxpayers $16 million to issue refunds to car owners who paid for the fee in advance. The TTC is off track, as only the bad news is catching our attention while the good news goes unnoticed. The TTC’s gotten negative press recently because pedestrians have died in accidents involving TTC vehicles, drivers have been caught texting behind the wheel, a fare increase was announced then cancelled, and then came the decision to reduce service on dozens of bus routes. On Jan. 1, Mayor Rob Ford fulfilled a key election promise to cancel the hugely unpopular car tax, which added $64 million to the city’s budget woes but placed $60 annually back in drivers’ pockets. Then on Jan. 10, Ford announced a 10-cent TTC fare hike to raise $24 million to balance the commission’s budget. When you did the math, it turned out that Metropass holders, like me, would pay exactly $60 more a year while drivers would pay $60 less. So a day later, TTC chair Karen Stintz announced the fare hike was nixed, as the city would chip in $16 million more for the budget and $8 million can be cut throughout the year.